Although Zion's Grotto Trail is only a short and level dirt path connecting Zion Lodge with the Grotto Picnic area it has great historical significance and several of Zion's more popular trails begin or end at the Grotto Picnic Area including Angels Landing, Kayenta Trail, West Rim, Lady Mountain and even technical slot canyons such as Behunin Canyon. Many of Zion's named landmarks are visible from this short path. Trail Conditions: Well maintained, dirt path. Trailhead: Grotto picnic area. Ride the shuttle when it is operating. In the winter drive into Zion Canyon and park at the Grotto Picnic area. 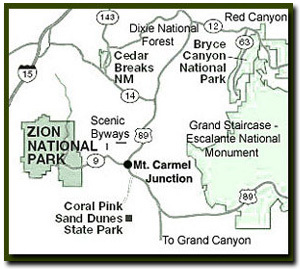 Trail Access: Usually from April 1st until October 30th Zion Canyon is accessed via the shuttle. Private cars are allowed in Zion Canyon the rest of the year. 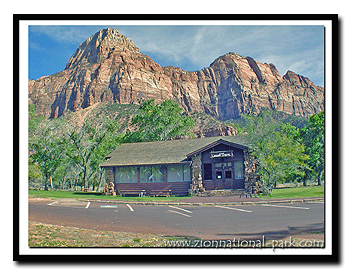 Park at the Zion Canyon Visitor Center to ride the shuttle and get off at the Lodge. Water availability: Water bottles can be filled at the Grotto Picnic area or the Zion Lodge. The Grotto Picnic area is the only picnic area in the main section of the park other than the small area near the Zion Nature Center. Most of the day that area is used by the kids program. There are fire grates at the Grotto, picnic tables, water and restrooms. Wood gathering is not permitted inside the park boundaries. One day while hiking down from Angels Landing Bo and I ran into an older couple at the start of the trail and they were looking for a hike to the Grotto. The Grotto is not an overhang or anything spectacular, but a clearing with historic buildings surrounded by Zion's splendor. Trail options - Hike along the Grotto Trail from Zion Lodge to the Kayenta Trail and loop back to the Zion Lodge via the Emerald Pools Trail. 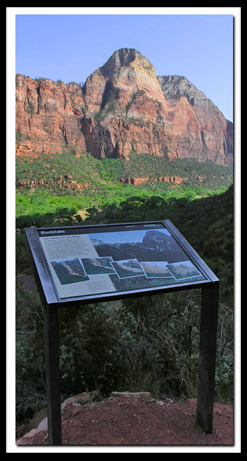 Zion Photo: This rock fall sign is located along the Middle Emerald Pools Trail and discusses the 1995 rock fall in Zion Canyon. Rock and debris slid into the Virgin River, damming the river and taking out much of the road. Zion Lodge - Wylie Camp, a tent camp, was the first site for lodging in Zion Canyon. Gilbert Stanley Underwood designed the first lodge which was placed on the Wylie Camp site. It was built in 1925 and burnt down in 1966, leaving only the original fire place standing which was incorporated into a new building. Stanley's work still survives in the cabins around the lodge, the dormitories and the charming Zion Nature Center located just off the entrance to the South Campground. In 1984 the smaller original cabins were auctioned off. My Grandma, Fern Morrison bought two of them and built them into her home, and rents the rooms out by the night. The new lodge was built by the Union Pacific Railway in 1992 to match the existing look. In 1997 many of the cabins were restored and are on the National Register of Historic Places as well as in the Zion Lodge Historic District. Zion's Grotto - Grotto Comfort Stations - I find it odd to use the term comfort station, but that is what seems to be the newest term instead of restrooms. They were constructed to be similar to the original museum. the south station was built first, in 1925 and the north was completed about the same time as the Zion-Mt. Carmel Tunnel in 1930 to 1931. I am quite fond of the stone work of the buildings in Zion, even when they are simply comfort stations. Both buildings got a face lift in 1959 and were listed on the National Register of Historic places on Valentines Day in 1987. This quaint building, Zion's oldest remaining building, was completed in 1924 and was used as the parks museum and contact station. The grotto was the campground at that time. In 1936 it served as a residence, like many of the other structures in the park for Zion's employees. As you can see in the photo, the stone work is much larger than later projects. The price tag of restoration boggles my mind for these historic buildings, but I believe it's money well spent and much of it is often obtained by grants and fund raisers. In 2009 work was completed on the Grotto Residence and today it is used as part of the artist in residence program. The original museum was placed on the National Register of Historic Places in 1987. Zion's Artist in Residence Program - For one month selected artists are allowed to stay in the historic building in hopes they can create artwork that can share the love many of us have for Utah's oldest National Park. Each winter and spring one artist is chosen. They can also stay rent free at either of Zion's campgrounds, but I can't imagine passing up the option to live in the historic cabin in the canyon. The artist is required to do a couple of programs for the public during their stay. For those who are interested contact Zion's Natural History Association.